HighPoint has started to ship its RocketStor 6600-series Thunderbolt 3 RAID enclosures that can accommodate up to eight storage devices. The enclosures support all popular RAID levels and can enable up to 1.6 GB/s throughput with HDDs or up to 2.7 GB/s throughput with SSDs, which is in line with other 8-bay TB3 storage boxes. Meanwhile, one of the key characteristics of the RocketStor 6618T enclosure is its $999 price point. The HighPoint RocketStor 6600-series family consists of three models: the RocketStor 6618A tower enclosure with hardware RAID and 8 bays, the RocketStor 6618T tower enclosure with software RAID and 8 bays as well as the RocketStor 6674T rackmount enclosure with software RAID and 16 bays. The DAS boxes support hot swapping of 2.5”/3.5” storage devices, RAID in 0, 1, 5, 6, 10 and 50 modes, intelligent fan control, audible alarms, and come with HighPoint’s storage management and monitoring software for Apple’s macOS and Microsoft Windows. The manufacturer ships its RocketStor 6600-series enclosures unpopulated and provides a list of compatible drives: the boxes support a wide range of enterprise and NAS-class devices, including 12 TB HDDs as well as up to 4 TB SSDs from various makers, including HGST, Seagate and Samsung. As for performance, the HighPoint RocketStor 6600-series are designed for various professional applications and are aimed to support simultaneous streaming, editing, and backup of UHD video or other data. 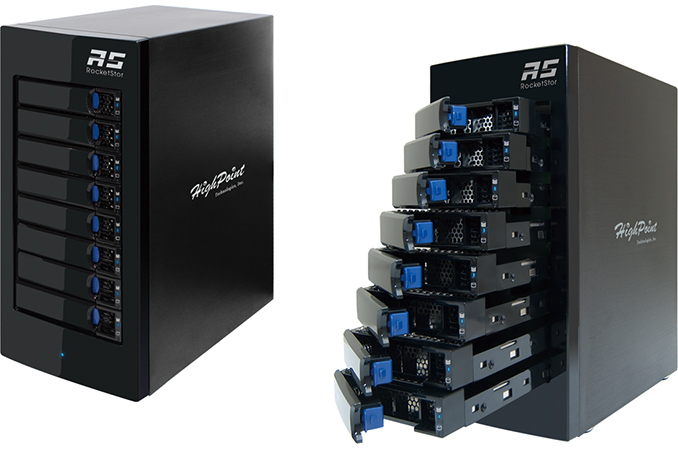 When an 8-bay RocketStor 6618A enclosure us populated with HDDs, its maximum sequential read performance is rated at up to 2000 MB/s, with SSDs, its performance as listed increases to 2700 MB/s. The RocketStor 6618T (with software RAID) is a bit slower, offering up to 1800 MB/s throughput with HDDs and up to 2400 MB/s with SSDs. At present, HighPoint does not reveal performance numbers for the rackmount 16-bay RocketStor 6674T. Just like competing DAS products from other manufacturers, the HighPoint RocketStor systems feature two Thunderbolt 3 ports, making it possible to daisy chain a display or another TB3 device to the storage arrays. The maker bundles one active Thunderbolt 3 cable certified for 40 Gb/s. 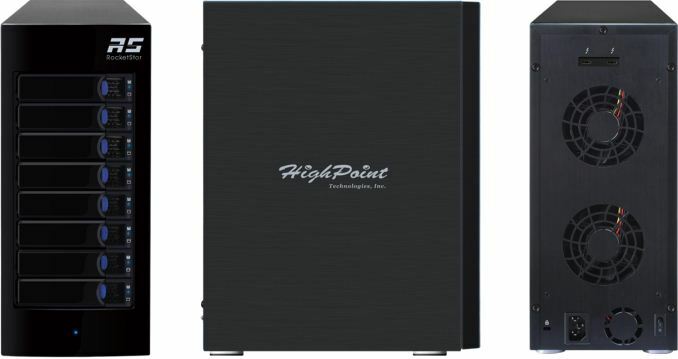 One of the key things about the HighPoint RocketStor 6618-series Thunderbolt enclosures are their recommended prices: the more advanced model 6618A is priced at around $1300, whereas the model 6618T (with software RAID and lower performance) is set to cost around $1000. With such price points, HighPoint aims to make Thunderbolt 3-based RAID storage solutions considerably more accessible compared to pre-configured off-the-shelf DAS systems. HighPoint claims that its RocketStor 6618T is now available in North America at its MSRP of $999. While the enclosure is available, in some cases it comes populated with HDDs and comes at appropriate price points. Meanwhile, Amazon offers empty RocketStor 6618T for $1092.19 (so, not quite $999) as well as empty RocketStor 6618A for $1299.